The women's collection Versace autumn-winter 2018-2019 was held in Milan, Italy on 23 February. The fashion show was opened by the 35-year-old supermodel Natalia Vodianova, who does not appear on the catwalks very often. "Russian Cinderella" tried on a stylish leather trench coat and a daring, bright mini. The creators of the collection clearly drew inspiration in the era of the nineties: in the forthcoming voluminous leather coats, colorful outfits, school uniforms, huge fan scarves, bulky heels and platform shoes, skirts with "torn" edges combined with sneakers. - Off with compromises. The collision of cultures, creating frictions and contrasts between the past and the future - the old faces a new, stylish goes against the informal, the sneakers confront the studs, - the collection's description on the site of the Versace fashion house. 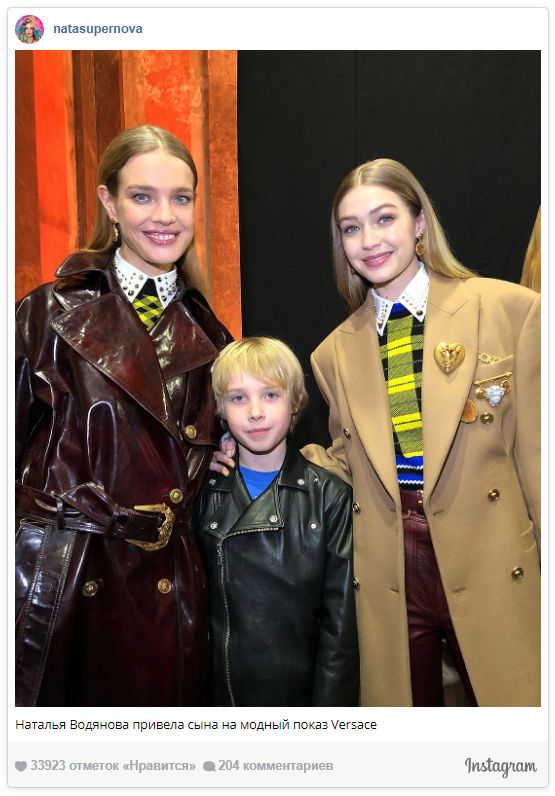 At a fashion show Natalia Vodianova came along with 10-year-old son Victor, who was dressed in a stylish leather jacket with the inscription "Young Versace" (name of the brand line for children - note) on the back. 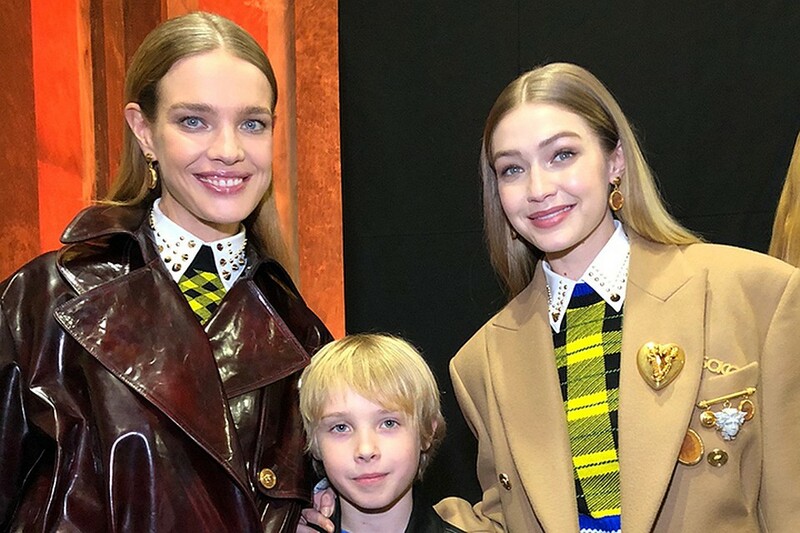 Apparently, Victor did not walk down the runway - after all it was a show of the women's collection - but he "showed up" in the photo with his famous mother and American supermodel Gigi Hadid, who also took part in the show. Recall, Natalia Vodianova has five children: four sons - Lucas, Victor, Maxim, Roman and the daughter Neva. With all this, the mother of many children does not cease to amaze the fans with her stunning figure and has time to engage in charitable activities around the world.